Storybench sat down with Jonathan Kaufman, incoming director of Northeastern University’s School of Journalism, to chat about his ambitions for the program and what he’s brought from past positions at The Boston Globe, The Wall Street Journal, and Bloomberg News. He most recently served as Bloomberg News executive editor where he oversaw a team of over 300 reporters and editors worldwide. 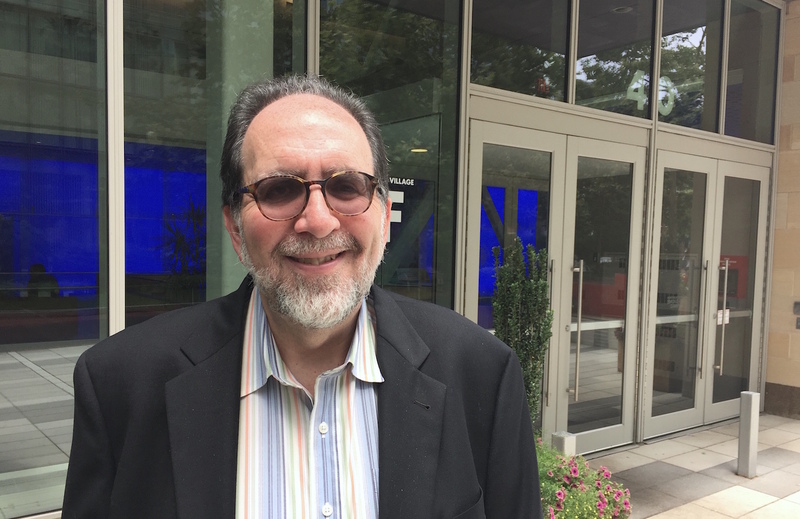 We asked the Pulitzer Prize-winning Kaufman about what journalism students need to know, what he looks for when hiring young reporters, and what he is looking forward to from Northeastern’s Journalism and Media Innovation programs. What advice would you give a 21-year-old you? Learn a language, take a math course, take more science courses, stretch yourself more. What every parent tells their child that heads to college. The great thing about taking journalism courses is that it exposes you to different ways of thinking. You get to follow the day’s events and think about how the country and the world is changing. Journalism teaches you how to write and it teaches you how to think–and those are communication skills that are valuable in every field. What do students need to understand about journalism today? There’s a revolution in data and interactivity. But this is the world that students have grown up in. It’s a very exciting time for creativity and innovation. I’m always looking to young people for guidance. It’s going to be my education hearing where students get their news, who they trust and what’s out there. News organizations are going through a lot of that. There’s a real desire to understand how millennials and this generation are going to interact and respond to the news. So you’re optimistic about the journalism industry. [inlinetweet prefix=”” tweeter=”” suffix=”@jkaufman617 on @storybench”]Five years ago I don’t think I was as optimistic about journalism as I am now[/inlinetweet]. For a lot of people in newsrooms there was a fear of digital technology. That’s shifted. There has been an incredible upheaval and what you’re seeing now is that legacy media has kind of figured it out with a combination of paywalls and free content. Meanwhile, new media, like BuzzFeed, Vice or Politico, are showing real signs of wanting to do serious journalism and wanting it to have impact. How does a veteran reporter or student begin to adapt to digital journalism? The same way you never sent a correspondent to a foreign country without some of the language and some of the history. When I went to Germany and China, I didn’t speak the languages very well but I was a quick study. I could figure out what the stories were and figure out how to report them accurately and figure out how to write them. In the same way, a student going into journalism these days has to know enough about data, enough about coding, enough about data visualization. These are tools that are going to be part of storytelling. You don’t need a PhD in them, of course, but you need fluency. You may not become a data journalist, but [inlinetweet prefix=”” tweeter=”” suffix=”@jkaufman617 on @storybench”]you need to know enough about data to have a conversation with a data journalist[/inlinetweet] in the newsroom. How do you balance teaching shoe leather journalism and the latest digital tools? The key is great faculty and we have that. We have faculty who are working every day with media organizations and they bring that knowledge–and those contacts–into the classroom. And I think what’s nice, in my experience in newsrooms, is that the people really appreciate each other. You need data journalists who are news junkies and shoe leather reporters who can have a conversation about how best to tell the story. Data stories work best when you have shoe leather journalists working with data journalists. They each bring something special but together they bounce ideas off each other and create something cool. How do you see Northeastern’s Media Innovation program, a new graduate degree in digital journalism, serving that need? The Media Innovation program is on the forefront of the digital wave. At the core is the question: How do we best tell a story? It may be a 2000-word article. It may be an 800-word article and a digital video. It may be an interactive game that draws readers in and hooks them that way. Our goal with Media Innovation is to give students the skills and ways of thinking that will make them nimble journalists for the digital age. They will be able to take the passion and curiosity that is the bedrock of any journalist and have the 21st century tools to turn out a great story that reaches the biggest audience. And outside the classroom they will have the chance to work with great editors and new media organization to get the experience and contacts that will lay the foundation for a great career. What do you see as the role for Storybench? What kind of journalists do you want Northeastern to produce? I want us to produce journalists who are passionate storytellers and have that idealism and tenaciousness that has always produced the best journalism. We don’t know what the 21st century newsroom will look like in 5 years, much less 10, so I want them to be nimble and have enough fluency in data, data visualization and the digital world to become a vital part of news coverage and newsroom conversations. And this is true not just for journalists. You need to be scientifically literate and data literate these days to function in the world. If you’re going to be a journalist covering Silicon Valley or Kendall Square, you have to be able to have conversations with people. Even speaking with your roommate, who may end up with a biotech startup, you have to understand what she’s doing and why. When I started out as a reporter for the Boston Globe and the Wall Street Journal, we always used to say you never knew when you walked into a newsroom whether you’d be covering a toxic oil spill, a school committee hearing, or a coup d’état in Brazil. You need to keep up on what’s going on in the world. And you have to remember that your biggest competition out there isn’t The New York Times or Buzzfeed or Vice or MSNBC–it’s people’s time. People are busy. They are globally connected. They are being bombarded by information from the media, from Instagram, from Facebook and Twitter. We need to be thinking: [inlinetweet prefix=”” tweeter=”” suffix=”asks @jkaufman617″]How do we cut through the noise and get our story heard and read and viewed? [/inlinetweet] We used to say at the Wall Street Journal that even when you write a front page story, only a third of people read past the “jump” and go to the continuation on page 14. That’s even more true today. Your mother will read your story to the end, click on all the links and write a nice comment. But you need to win over everyone else and think about the most effective way to pull in people and get them to stay with you. What are you looking forward to from Northeastern students? The students I’ve met so far combine creativity and innovation with a real passion for journalism. They want to use interactive tools and digital tools to tell a story about the incarceration rate of men and women and what that does to society, or they want to go overseas and report in places like South Africa and find ways to use video to tell that story, or they want to work for an NGO or work in public health or science and find ways to deliver the message in effective ways. I want to encourage students to be bold. I want students to leave Northeastern with the self-confidence and skills and passion to make a difference in the world. And to have fun doing it! What are you looking for when hiring reporters? [inlinetweet prefix=”” tweeter=”” suffix=”@jkaufman617 on @storybench”]When I hire I look for passion. Are they curious? [/inlinetweet] Would they go the extra mile for the interview? Would they miss the party on Saturday night because they had the chance to score a great interview? And do they ask themselves, “What’s the best way to tell this story?” Will they be open enough to say, “No, no, not a 1,500-word article. Better to do 500 words plus a video plus an interactive chart.” [inlinetweet prefix=”” tweeter=”” suffix=”says @jkaufman617″]I think young reporters, writers and producers should push us[/inlinetweet]. Newsrooms are collegial but also contentious. You want people to speak up. If I had one disappointment in the hiring process when I was at Bloomberg it was that these very smart reporters we hired weren’t pushy enough. They weren’t in my face more, telling me how to best get the story across. And will Northeastern produce those kind of interviewees? It used to be that you had to start out in a place like Buffalo and twelve years later you could make it to the Boston Globe. At Northeastern, we have coops at MSNBC and the Boston Globe, and overseas. Those opportunities are extraordinary and we’re going to train students to meet that challenge. The escalator can be very rapid. If you’re good, you can be at a national publication very quickly. You’ll pay your dues here, we’ll work you hard and give you good editing, but once you’re out there I think the opportunities will come very quickly. What’s journalism going to look like tomorrow? We don’t know what journalism is going to look like in five, ten years. We just know that it’s going to be rich and exciting. We want to produce students that are ready for it. It’s scary, but it’s good scary.